But as I was getting ready to invite this year’s sixth graders into our “classroom” on Gamestar, I began weeding some former students out. I let them stay in the premium space until I need their slots for my classroom account, and then I boot them out. They all know this, so it won’t be a surprise, and they don’t lose their work. They just lose their premium status (unless they want to pay Gamestar). As I was removing students, I noticed something that caught my eye. 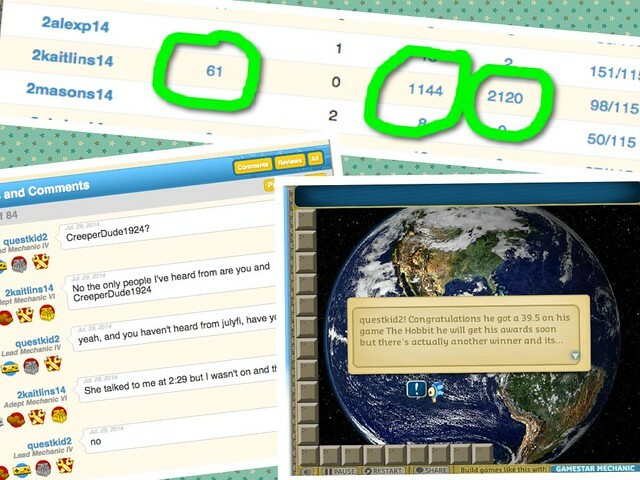 One of my students had not only created 61 video games, she had also reviewed 1,140 games of other players and left 2,120 comments on other people’s games. Now, that’s a lot, and I wondered what was going on with her since she left our school last June. I know she loved the site, and that she is very social by nature, but even for her, this amount of activity seemed excessive. So, I trolled her account a bit, checking out her games, and it turns out, she was up to something very interesting. Throughout the summer, she had been constructing an informal network of other gaming kids to create a series of game design challenges, using the comment box/review box features for the games to organize the network of other kids. They would plan “meet” times in Gamestar, and then leave a thread of comments as they planned out the next activity, and then go through a voting system, and then announce the winners with a published game. They “followed” each other to keep track of the activity. On one hand, this is the most inefficient system to do this kind of community building. The site is just not built for this. On the other hand, I am so proud of her for hacking the system to make it work for her, to some degree, and for constructing this whole framework of young gamers in Gamestar Mechanic. Reading through just some of the comment threads (there is no way I can get through 2,000 of them), I can see these kids navigating what it means to write in online spaces and using media to create things together and to find common ground among interests. All of this … on their own, completely outside of the radar of any adults, as far as I know. I only stumbled upon it accidentally. Needless to say, I did NOT bump HER from my classroom account. I’m going to give her the room she needs to do what she’s doing, and see where it takes her. This entry was posted in Gaming in the Classroom, my classroom, Slice of Life. Bookmark the permalink. Kevin, I always love it when the kids take off on their own like that. It’s almost like I become nonessential as my students find new ways to use what I’ve taught them. What your student did is so impressive. I’ll be checking back to learn more about Video Game Design unit. It’s an area I know nothing about and I find it very intriguing. Happy Thanksgiving! Wow! I love this! After 21 years, I continue to be amazed when students take the lead and demonstrate literacies we work so hard to infuse in them. What a great example! As the wife of a 44 y/o online gamer (professional by day, gamer by night/weekend – occasionally), I am especially impressed with her fortitude to, as you say, ” ….hacking the system to make it work for her, to some degree, and for constructing this whole framework of young gamers ….” wherein they are having to navigate the necessary reading and writing, which speaks to my Reading Specialist heart 🙂 . Great post and thanks for sharing. Glad to hear you didn’t bump her out of the premium account. I suspect you’ll continue to read great things about your aspiring game-world community builder. BTW, found your post via Slice of Life this morning. No school for us this week.. time to read and write. Thanks, Robin. I hope to see where she take sit … I suspect I will see her back at our school again one of these days (she’s that kind of kid). Wise move – her learning adventures will lead to a few for you, I’m guessing. Wow. Amazing what kids do when we give them the opportunity. It’s wonderfully inspiring when you see this happening. I think parents and teachers are always hoping for something like this. It is one of my Whys as a trainer/teacher to provide trainees & students whether they are adults or kids with opportunities where they find their own inspiration. I only wish that schools create those opportunities more often. Reminds me of Sugata Mitra’s hole in the wall gang. Humbling, isn’t it? Right place, right time, just the right amount of support. I wonder if she woulda done what she done without you. Probably, but very differently. I really appreciate how you are treading so lightly around her works. Keep on, dude.